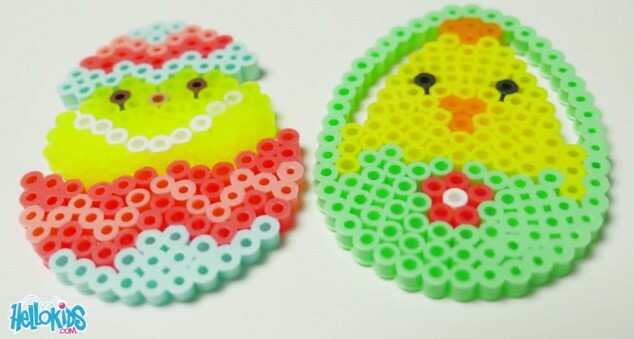 Here are two pretty models of Easter eggs to make with Hama beads. These ironable beads can be used to make lovely figures for (Easter). All you have to do is choose the right colors and models to create Easter eggs to hang or to decorate the table with. You have to be focused and precise to properly place the beads. 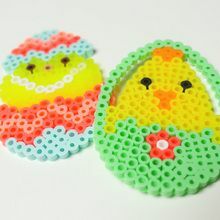 Mothers as well as children will love to make these decorative eggs out of Hama beads. 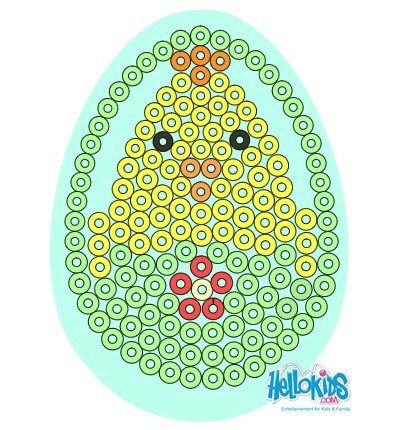 The first Easter egg is a little chick coming out of his shell of spring colors. The mix of yellow, lagoon blue, coral and peach is very bright. The second bead model represents a green Easter basketof water containing a newly hatched (chick). The use of transparency is very original and gives dimension to the creation. Age: as from 7 years. The ironing stage requires the help of an adult. 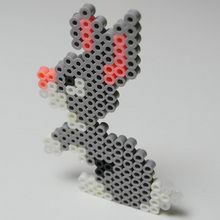 How do you make an Easter egg out of Hama beads? Print your model of choice which you will find at the bottom of the page. 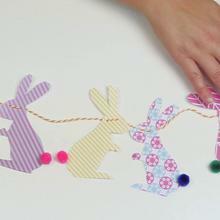 Afix the egg shaped peg board to a flat surface by placing a small piece of double sided scotch tape under the form. This step is important as it will ensure that your model does not move. Make sure that there is an electrical plug nearby for the ironing stage. Plug in the iron after making sure that the steam function is off. Start to place the beads one by one on the points of the peg board as shown in the model. Place the ironing paper on top of the egg and iron the visible side of the figure carefully in small circular motions for 1 to 1:30 minutes. Carefully unstick the paper and turn the mold over. Position the paper again and and start step 5 again. Finally place the Easter egg under a heavy book while it cools down, this will prevent your Easter egg from warping.